Similarly, the population of orangutan also spreads across Central Kalimantan outside protected area such as Sebangau National Park and Bukit Baka Bukit Raya National Park (BBBRNP), where land conversion, concession, forest management units and community land co-exit together. It’s important to begin working on the establishment of the first essential ecosystem area in Katingan Kahayan to safe guard the habitat of orangutan and other wildlife that live within the area. 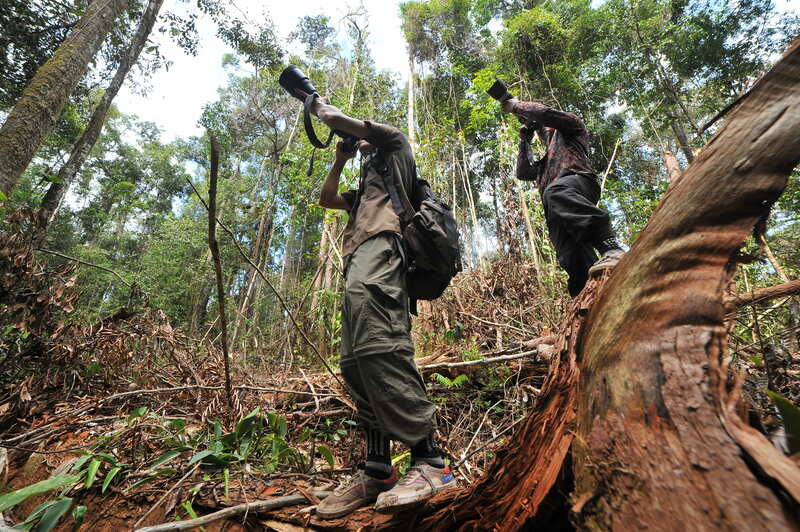 Around 70% of orangutan population are living outside protected areas in Kalimantan. Similarly, the population of orangutan also spreads across Central Kalimantan outside protected area such as Sebangau National Park and Bukit Baka Bukit Raya National Park (BBBRNP), where land conversion, concession, forest management units and community land co-exit together. This condition provides a different constrains for human and wildlife conflict especially orangutan which habitat has been gradually decreased. Thus, it’s necessary to connect orangutan habitat that lies between the two National Parks (NP) and to ensure the sustainability of orangutan population and other wild life respectively. 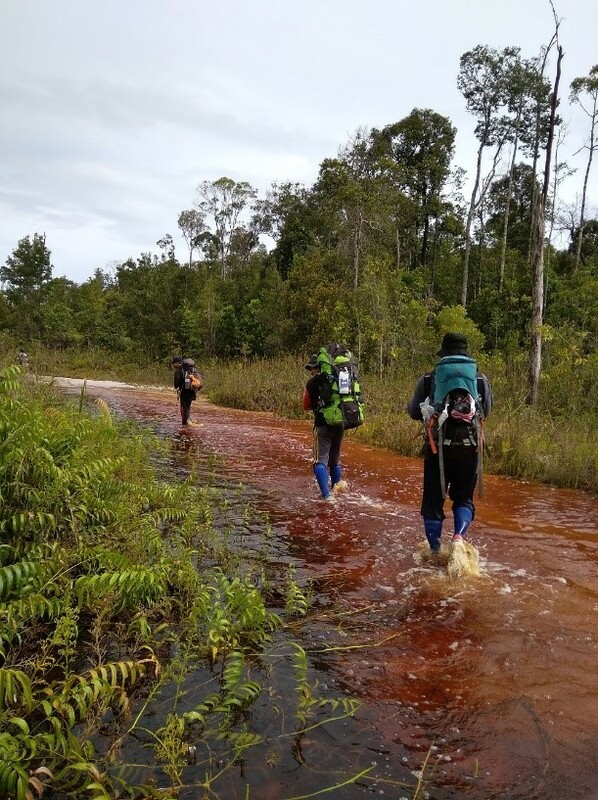 Unfortunately, the habitat of orangutan within the potential corridor area are also scattered, these current conditions if left untreated without any clear intervention, would make their future existence vulnerable. Human and wildlife conflict will be eventually inevitable, as a result of the very nature of land use in the potential corridor itself. 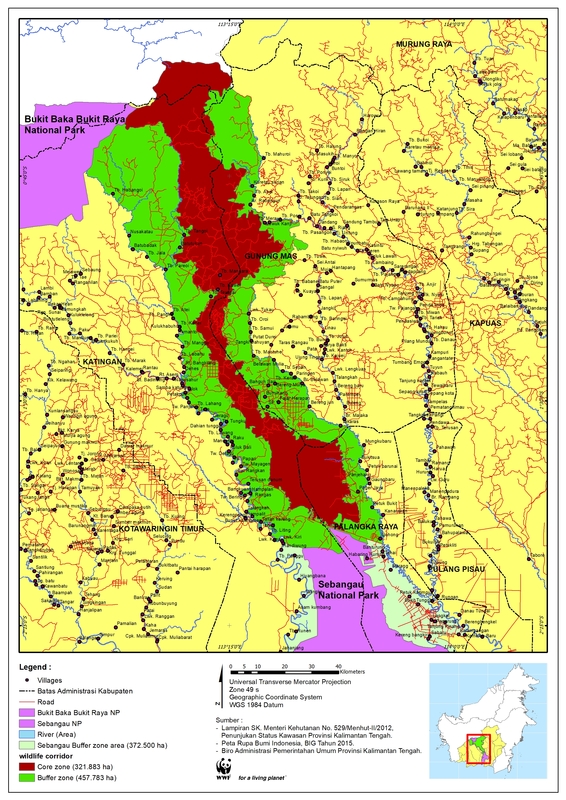 There are around 19 concessions with the permit for logging activities (8 companies are located in priority area), 26 palm oil plantations (10 plantations are located in priority landscape), and around 64 mining companies with 23 are existed in priority area. Furthermore, there are around three Forest Management Units (FMU) located in the potential EEA; FMU Katingan Hulu unit XVII, FMU Kahayan Hulu Unit XV and XVI and FMU Kahayan Tengah Unit IV. Therefore, as the preparation to kick off an initiation for Essential Ecosystem Area that later called Katingan Kahayan Essential Ecosystem Area, several actions have been carried forward since the early 2018 by WWF and partners such as; orangutan survey in the corridor between Bukit Baka Bukit Raya National Park and Sebangau National Park, survey on natural resource identification on FMU Katingan Hulu/FMUXVII, and study on Knowledge Attitude & Practice on the community within the corridor. These approaches were taken as part the Planning-the first step in essential ecosystem area protection guideline based on MoEF that included identification and inventory of ecology, social economy, mapping etc. Based on the orangutan survey results, it’s found that there are approximately 700 orangutans live in the corridor surrounded by illegal mining activities, logging concessions activities, and palm oil plantations. The Orangutan density is proximately around 0,59 Orangutan/km (p = 0,89; r = 1,16; t = 365). The potential corridor that has been surveyed is easy to be accessed from every direction, that is why the threat looming towards the area is also greater. As for the Knowledge Aptitude Study (KAP) was conducted showed that local communities’ dependency towards extractive natural resource to meet daily needs are still high, they usually able to find source of foods from the forest. A healthy ecosystem will provide and safeguard the local food needs and cultural tradition of local people. To be in the same perception and understanding toward the importance of EEA and the benefit for local people and stakeholders involved, hence WWF initiated a kick of workshop in late November 2018 to gather relevant stakeholders like government, private sector, CSOs, local community, indigenous people, etc. with the support of the MoEF, Directorate of Essential Ecosystem Management. The one-day workshop conclusively thrived in stressing the urgency to establish essential ecosystem in Katingan Kahayan area to the stakeholders and everyone agreed that the follow up action will be to form an taskforce that will be task to hatch the ecosystem area. The potential Essential ecosystem area will be designed to protect both wild life and to provide economic benefit for the local communities surrounding it, therefore a win-win solution where people able to live in harmony with nature and hold up to the values of protection, preservation and cultural identity.